Lin’s research has been supervised by Rajat Mittal, a professor of mechanical engineering. “This research is important because it attempts to not only address issues related to bio-inspired design of MAVs, but it also explores fundamental questions in biology related to the limits and capabilities of flying insects,” Mittal said. To conduct this study, Lin has been using high-speed video to look at how changes in mass distribution associated with the wing flapping and body deformation of a flying insect help it engage in rapid aerial twists and turns. Lin, a junior mechanical engineering major from San Rafael, Calif., recently presented some of his findings at the annual meeting of the American Physical Society’s Division of Fluid Dynamics. The student also won second-prize for his presentation of this research at a regional meeting of the American Institute of Aeronautics and Astronautics. 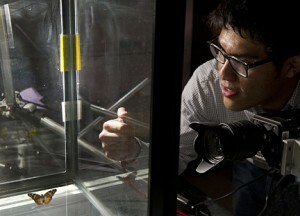 The butterfly research will aid the development of flying bug-size robots. 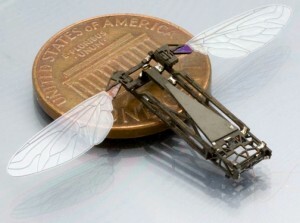 Pictured is an insect-inspired flapping-wing micro air vehicle under development at Harvard. Photo provided by Robert J. Wood, associate professor, and Pratheev Sreetharan, Harvard Microrobotics Lab, Harvard University. Lin’s newest project involves even smaller bugs. 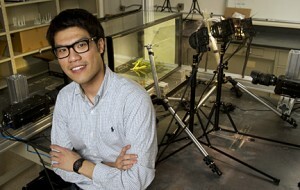 With support from a Johns Hopkins Provost’s Undergraduate Research Award, he has begun aiming his video cameras at fruit flies, hoping to solve the mystery of how these insects manage to land upside down on perches. Video and color digital images of the butterfly research available; contact Phil Sneiderman.